Ham & High readers pledge to buy Highgate boy his own cello | LEARN TO PLAY THE VIOLIN FOR FREE! The show will go on for Jahleel Weisser of Holy Lodge Mansions on the Holly Lodge Estate in Highgate, after readers pledged more than £500 towards getting him the new stringed instrument. It comes after this newspaper published his appeal to raise the much needed funds to buy his own cello after Archway Children’s Centre cuts his free music lessons and instrument loan. Delighted Tamatha Weisser, Jahleel’s mum, said she was “overwhelmed” by the response. “I can’t believe it, this is amazing,” she said. “The speed of the response and the level of generosity is just unbelievable. “It will just take the pressure off me trying to find some form of funding. It felt like I kept hitting a brick wall because of his age. The four-year-old first picked up the stringed instrument last year at the children’s centre, where he so impressed the two cellists who ran the class that they agreed to give him free lessons and loan him a cello. But they have been forced to withdraw the loan after Islington Council ruled that no child outside the borough’s borders could go to one of its centres – even if it is their nearest one. 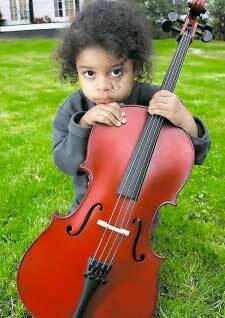 Jahleel had to hand back his cello last Saturday (September 24). One of the donors, who wanted to remain anonymous, said: “No child should have to do without music once they have developed a passion for it. via Ham&High readers pledge to buy Highgate boy his own cello – News – Hampstead and Highgate Express.